There have been a number of republics down through the ages; one of the greatest was the ancient Republic of Rome. We all know how it was with the advent of Julius Caesar and the subsequent rise of Octavian (aka Augustus Caesar) that the Roman Republic was dealt its death blow and replaced with a monarchial form of government headed by an emperor. MARCUS: Ah yes, ah yes. I remember. You see that map, Maximus? That is the world which I created. For 25 years, I have conquered, spilt blood, expanded the empire. Since I became Caesar I have known four years without war – four years of peace in 20. And for what? I brought the sword, nothing more. MARCUS: Please, please don’t call me that. Come here and sit. Let us talk now, together now. Very simply, as men. Well, Maximus, talk. MARCUS: [Tenderly holding Maximus’ head with both hands]: Maximus, that is why it must be you. MAXIMUS: But surely a prefect, a senator, somebody who knows the city, who understands her politics…. If you have seen the movie, you know that Commodus murders his father and assumes the title of Caesar. He attempts to have Maximus executed but Maximus escapes and ends up as a gladiator. 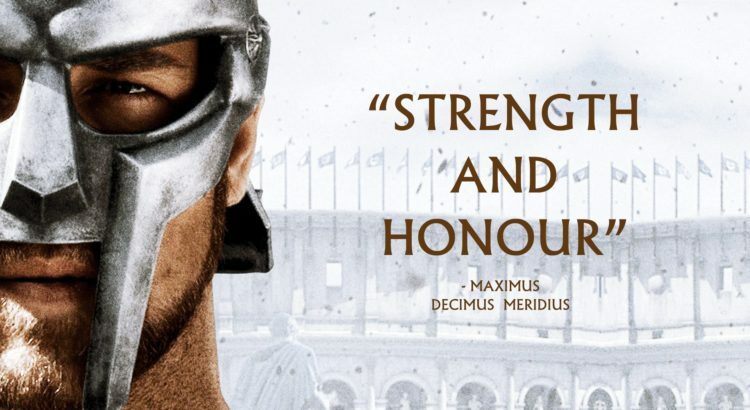 As a gladiator he ends up fighting in the Coliseum in Rome, and in a one-on-one battle with Commodus, kills him and returns power back to the people. In 2016 the citizens of this republic elected a non-politician to be our president because we were tired of the corruption of those who have worked their way up the political ladder that is our federal government. The appeal of Donald Trump to many was he had not been corrupted by the politics of “Rome” (Washington, DC) and pursued the office because of his perceived genuine love for his country and desire to make it great again. Do I agree with everything President Trump has done? Absolutely not. Do I think he is firmly grounded on constitutional principles? Unfortunately no. But one thing I do know – he has the tenacity and courage of a gladiator, and with our republic on the brink of vanishing, we need someone who is not afraid to wield a sword in the arena of political combat. In the 2016 election we had the choice between one in the mold of the corrupt and power-hungry Commodus and one who was not of the political class and was asked by the people to return the power of government to them so that like ancient Rome, America can once again be that shining light on the hill. Like him or not, President Trump could well turn out to be our Maximus. Just What Did We Declare?